Enjoy this comforting, warm, and wholesome stew filled with veggies and protein! As the weather gets colder, I’m craving soups, teas, coffees, and snuggles. Especially if those snuggles are by the fireplace in my parents’ house with our big dog, Samson. Samson loves to lie right in front of the fire after we’ve been wrestling in the snow outside. I am pretty sure this is how we all feel after going to the 5:30 AM class in freezing temps when the WOD has running programmed! 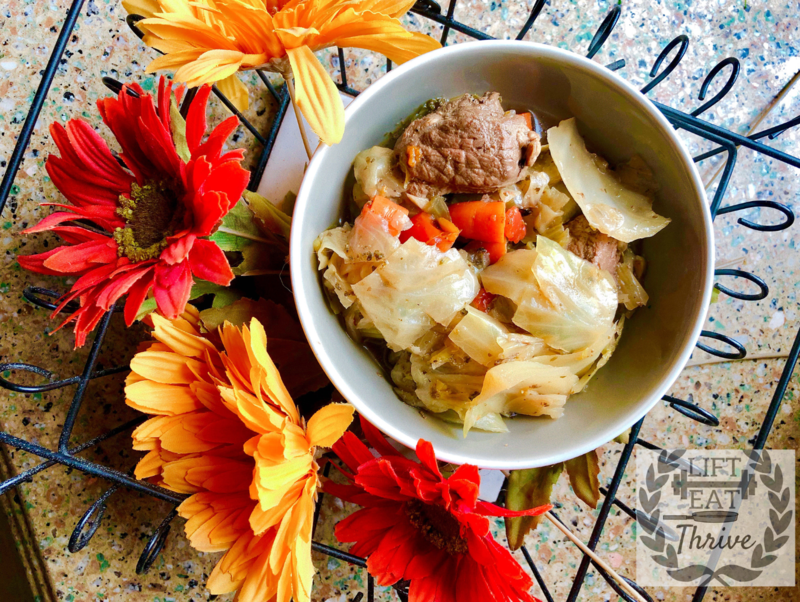 Anyway, those moments back home are few and far between these days, so instead I made my first Instant Pot recipe that snuggles you from the inside-out! If cabbage isn’t your style, play around with other vegetables and leafy greens, such as kale, chard, or even potatoes (for something more hearty). I love stews like this for the simple fact you can easily substitute a variety of ingredients while keeping the same base of spices and broth. If you have kids, it is a strategic way to get them some much needed vitamins and minerals, especially if you are using bone broth! (Inspiration for this recipe came from SimpleHappyFoodie.com).You can also do this in a Crock Pot. Please see comments at the end! For more content and recipes, be sure to check us out on Instagram at @lift.eat.thrive! Instant Pot cook time: 7 min + time for heating and de-pressurizing. First, set your Instant Pot to saute- add ½ tbsp of oil to bottom and cook meat until browned. Set aside. Add garlic and onions to the pot. Stir occasionally, until cooked through. Combine remainder of vegetables, potatoes/squash, and broth, add back the meat to the pot. Toss in spices (I liberally add spices because they make everything better). Attach the lid to your pot, then set it to pressure cook for 7 minutes. It will take time to heat up, then it will continue to cook. When it is finished, allow to depressurize by itself. (After about 8 minutes, you can try to release some pressure manually- just be careful! **Comment: if you have a slow cooker or Crock Pot, simply perform the first 2 steps in a fry pan, then perform the rest of the steps in your slow cooker. I suggest cooking for at least 6 hours to ensure everything is well cooked through**.